David Breuer-Weil is showing seven spectacular new paintings based on his own palettes in âVogue Landscapes,' the summer exhibition in the Cork Street Gallery, Alon Zakaim Fine Art. As Breuer- Weil states: At art school I discovered the least known of Francis Bacon's works: The orange and red spots that were found on the walls and doors of his studio where he mixed his paints and cleaned his brushes. I was mesmerized by the colour and chaos. Seeing this when I was an art student, I started keeping my own palettes as if they were fully fledged works. 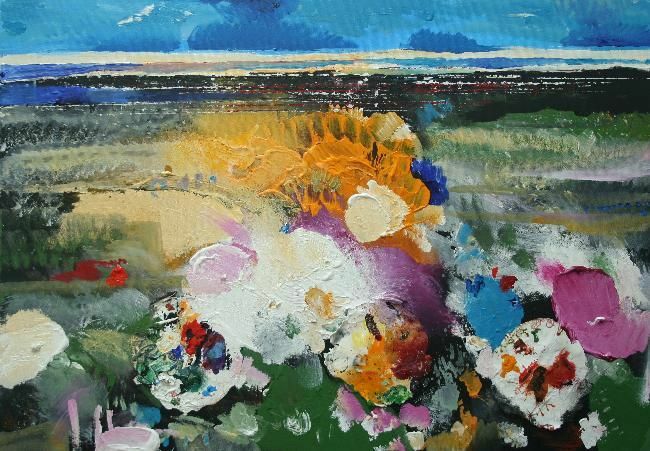 When Vogue magazine published an article on contemporary landscape paintings they devoted half a page illustration to my palette, thinking that it was a deliberately executed landscape. Out of this came the idea that palettes are perhaps the most beautiful paintings, because they are completely lacking in any kind of pre-meditation. I decided to make a new series based on these bi-products of the studio. These paintings are landscapes in the truest sense, because they are a build up of layer upon layer, an archaeological dig, but in reverse. They reflect the crucial moment when the artist looks up from the palette into the distance. "